I didn’t know that taco night was a thing until I moved to California. Now I’m a convert. Mostly because having tacos for dinner means I can throw a few leftovers, something fresh and lots of healthy veggies onto the table and my boys will make their own dinner. 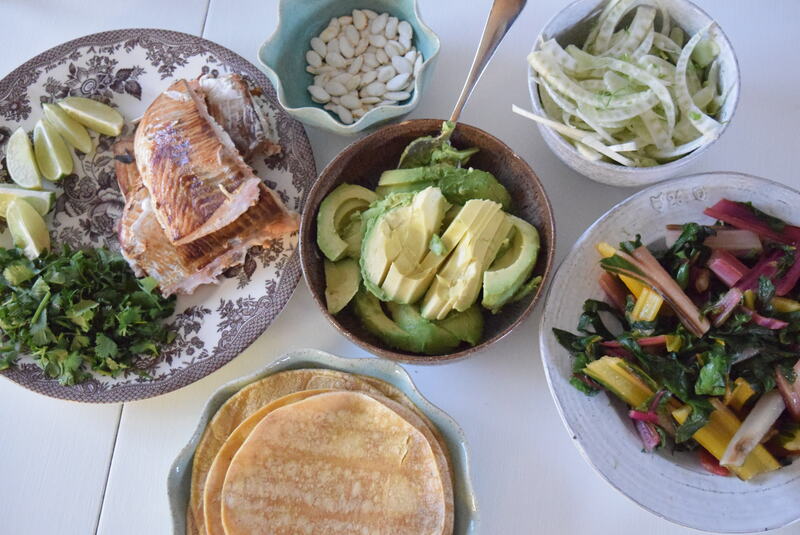 It is a very sociable way to eat and allows people with varying dietary needs to eat together easily and this salmon tacos recipe is no exception. Avocados are the gateway drug that get my boys into other veggies so I always include them. We often have salmon but last night I added rainbow chard, shredded fennel and toasted pumpkin seeds to the mix. Everything was gobbled up. 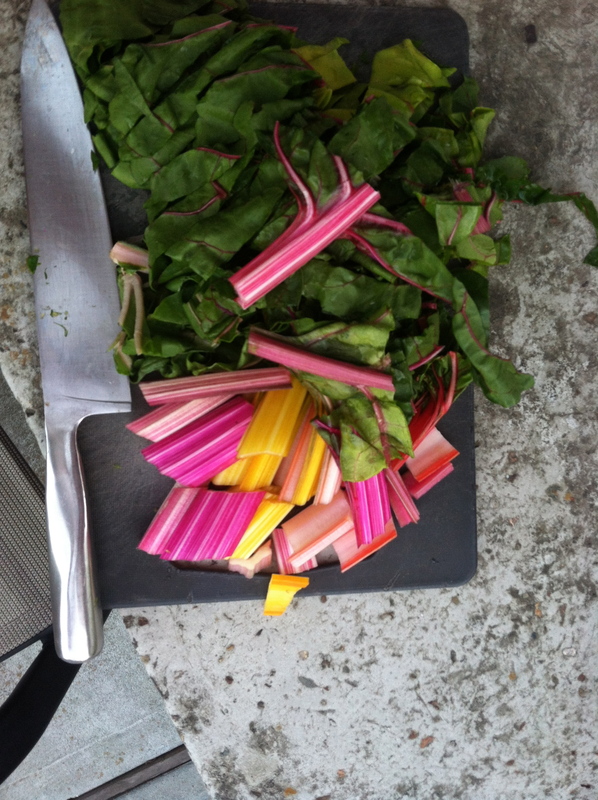 My littlest had picked the rainbow chard at the farmers market. The deal is that when we go to the market they each get $5 and a shopping bag and they must buy something they’ve never tried before. They have to ask the stall holder for it, pay, get their change and say thank you. It is a lovely way to get small children involved in what they are eating. And it helps them practice their counting and manners too. As they get older I hope they can chat to the farmers a bit more to understand how their purchase was grown. Below are all the instructions for you to replicate this feast at home. 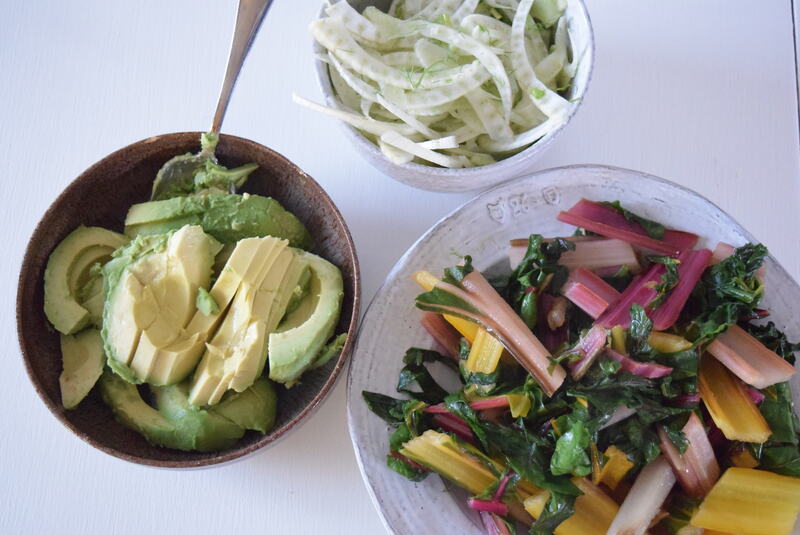 If tacos aren’t your thing, the veggies work well as a side dish for anything you’re eating. This mixture of goodies also works well with roast chicken or with grilled prawns. And while we’re on the subject, here is another of my taco night recipes. 2. 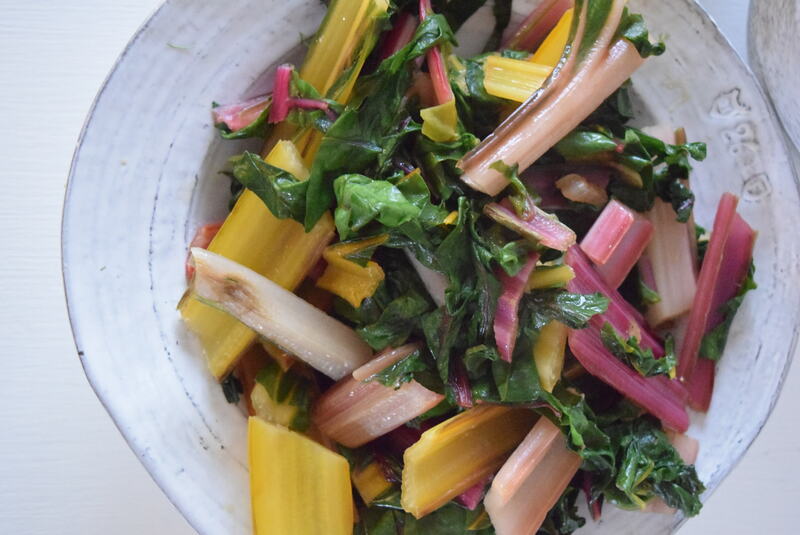 Heat your frying pan on a high heat and add your garlic oil or your oil and chopped garlic then add your chard. The water that is clinging to the leaves will help it wilt. Stir it every minute with your tongs to make sure it cooks evenly. It should be nicely wilted in about 3 minutes. Add some Maldon salt and a teaspoon of red wine vinegar and stir. Taste and adjust the flavour then scrape into a bowl and set aside. Return the empty pan to the heat. 3. Rub the outside of your salmon with a little olive oil and sprinkle it with salt then place it into your pan. You want to hear it sizzzle. Depending on thickness of your salmon and how pink you like the middle it will take between 6-8 minutes to cook on a high heat. Don’t move it for 4 minutes then use a fish slice or spatula to flip it over and cook the other side. 4. 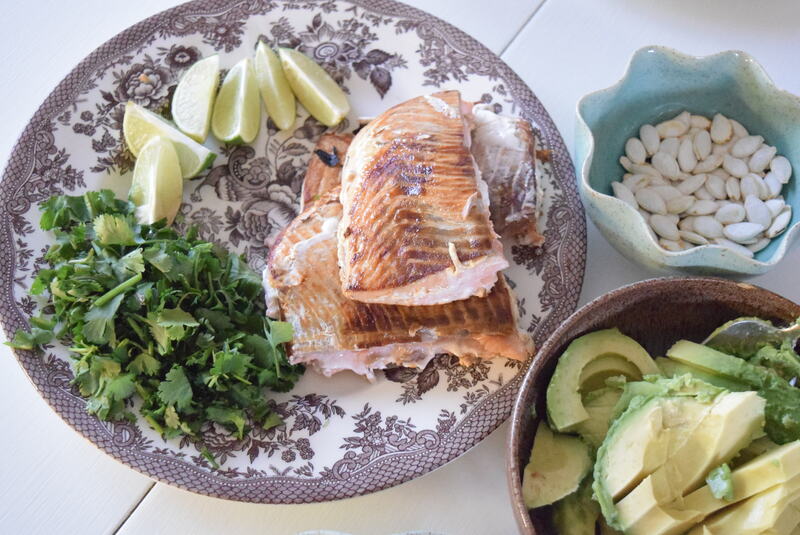 While your salmon cooks, start heating your tortillas in a dry frying pan.You’ll need to do this in batches. Once they’re warmed, pop them on a plate and cover them with a tea towel to keep them warm. 5. De-stone your avocado and chop it into slices. Pop the slices in a bowl with a sprinkle of Maldon salt. Top with a squeeze of lime (about half a lime). 6. 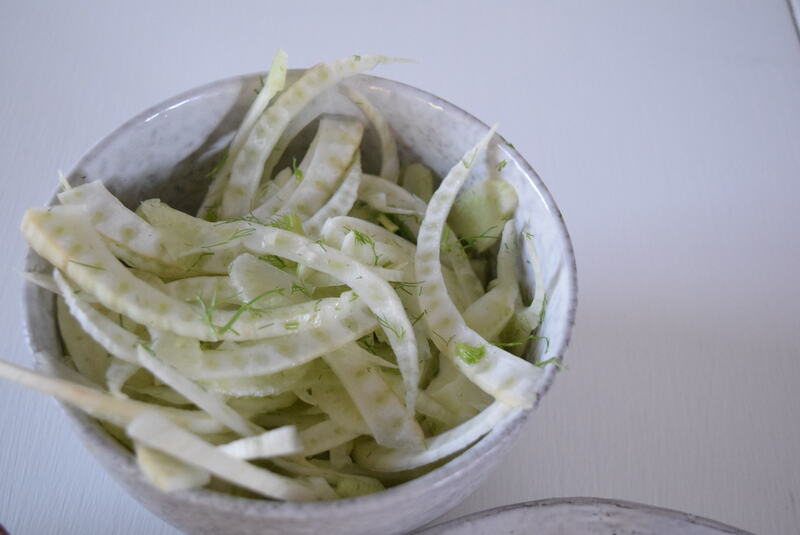 Chop your fennel into fine slices and put them into a small bowl. Keep the fronds and toss them with the sliced fennel, a pinch of salt and the zest and juice of half a lime. 7. Chop your coriander [cilantro] and put it onto a plate along with a lime, cut into quarters. 8. By now your salmon should be ready. If in doubt, cut it in half and check how pink it is in the middle. Take it out of the pan and put it onto the plate with the lime and coriander. 9. Pop your pumpkin seeds into the salmon pan to warm a little while you take everything to the table. I gently use a fork to flake the salmon into big chunks – much nicer than chopping it. 10. 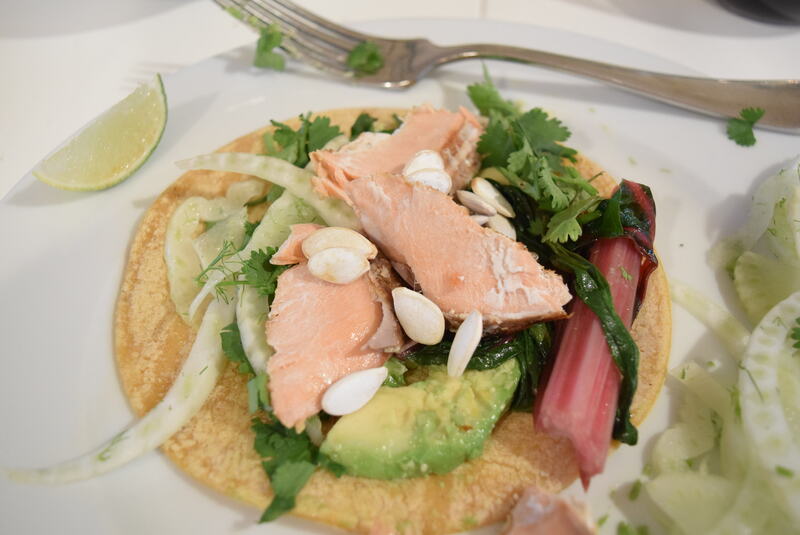 I like to assemble my taco by spreading a little avocado on the tortilla, then topping it with some of the fennel, some chard, a sprinkle of cilantro and seeds and a chunk of salmon. I always dribble a little hot sauce or Sriracha on mine and a squeeze of lime is key. Then fold that baby up and apply to face. Find more recipes for salmon, fennel and mid week meals here. Remember to share this on my Facebook, Instagram, Twitter or Pinterest when you make it. Tag it #ystcook so I can see!